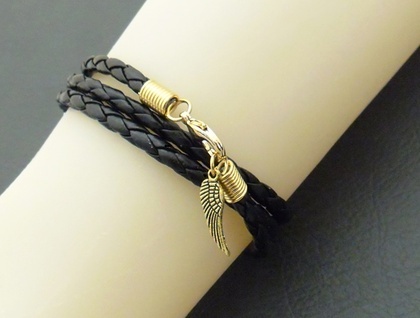 This wrap-around bracelet consists of a single length of black, braided leatheroid (imitation leather) which fastens with a high quality, gold plated lobster-claw clasp. 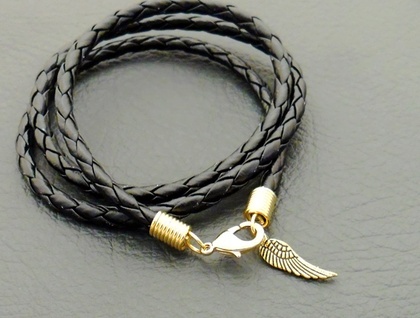 The bracelet finishes with a tiny angel-wing charm in antiqued goldtone. A silver coloured version is also available here in my Felt shop: two of the photographs show the silver coloured version, and one shows the extension chain. 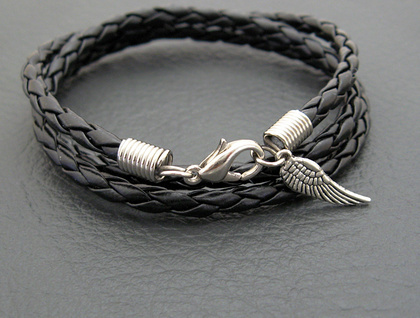 A custom length bracelet can be requested; simply send me a message via the 'contact this maker' link on the left. To get an idea of how long you want your bracelet to be, wrap a dressmaker's measuring tape around your wrist however many times you want the bracelet to wrap, being sure that the part of the tape that you are holding meets the beginning of the tape (because both ends of the leatheroid must meet so that the bracelet can be clasped). Alternatively, use a piece of string or cord to wrap around your wrist, then measure the string. I can also add an extension chain (at no charge) if you want to be able to control precisely how the bracelet will fit. 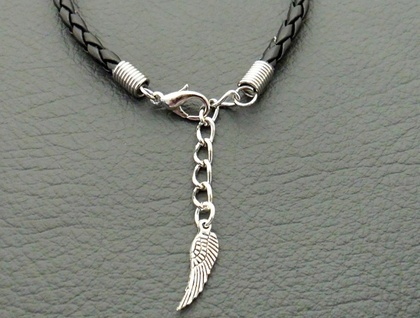 The chain will be gold plated, to match the clasp. It will be relatively short, so that there is not a long tail of chain dangling from the bracelet, but it will allow you to adjust the fit with greater precision. One of the photographs shows the silver-coloured version of this bracelet with an extension chain. If you would like an extension chain on your bracelet, simply leave a message in the 'notes for silverlight' field that will appear when you check out of Felt.